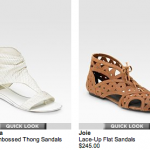 hot summer sandals from…ll bean? 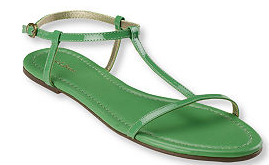 yeah, can’t believe i’m about to say this, but…check out these darling sandals from ll bean! in my efforts to be a bit more financially responsible these days, i’ve been finding myself looking for fashion in the most unexpected places, and this just goes to show there’s style everywhere. 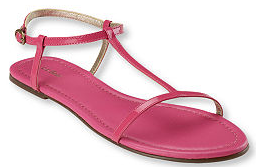 these sweet little t-strap sandals are just what i’m after right now – the colors are perfect for summer, they’re actual leather (including a leather footbed, so no sweaty soles), and they’re only $44! the only caution i’d give is that a t-strap can be tricky if your feet are on the big side, or if you’re self-conscious about your toes. just like a horizontal stripe, the wide bar at the base of your toes can accentuate, depending on where it’s placed – which, of course, is hard to tell from a picture. 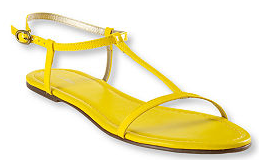 but i still think these are definitely worth a try – the only question is which color to choose. 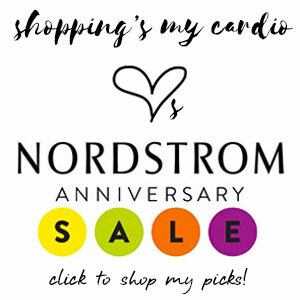 This entry was posted in shoes, spring and tagged ll bean on 7 April, 2009 by shoppingsmycardio. Those are fantastic! Isn’t it fun when you stumble upon a stylish find through an unexpected vendor?